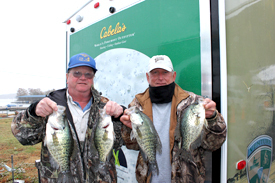 This past weekend Crappie USA held the prestigious 2012 Cabela's Crappie USA Classic on the Kentucky/Barkley Lakes at the Lake Barkley State Resort Park near Cadiz, Kentucky. Harsh weather with temperatures dropping nearly 25 degrees, 15-25 MPH winds and waves as high as 4 feet couldn't hold back the 171 teams from 18 different states competing for the nearly $108,000 in cash and prizes. "This was truly one of the most memorable classics even with inclement weather in my 28 years of managing classic events", said Crappie USA CEO Darrell Van Vactor. 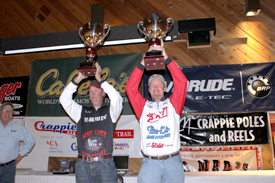 Crappie USA Classic winners Wade Hendren and Roy Logan. Taking first place was the team of Wade Hendren of McKenzie, Tennessee and Roy Logan of Paris, Tennessee with a two-day total weight of 19.18 pounds. The duo fished in Big Sandy over manmade cover in 10-12 feet of water, using live bait on B'n'M Poles to catch over 60 keepers. The team earned $40,000 in cash and prizes including a new Ranger V118 boat with an Evinrude Outboard, Minn Kota trolling motor, Humminbird electronics along with the $1,400 Driftmaster package and $2,000 in cash money. Second place went to the team of Paul Eldridge of Spring Valley, Ohio and TJ Harper of Springfield, Ohio with 18.58 pounds of crappie, earning $5,000. Paul and TJ were vertical fishing black/chartreuse Southern Pro on Gamma Line over 25-30 feet of water on the southern end of the lake, catching over 50 fish for the two-day event. Jim Freeman of Eddyville, Kentucky and Garrett Bridges of Smithland, Kentucky placed third with 18.53 pounds, earning $2,000. Freeman and Bridges fished the north end of Barkley spider rigging over 20 feet of water using white glow jigs with pink heads to catch over 70 keepers in 2-days. The Memphis, Tennessee team of Warren Cotton and Kirk Lewis took fourth place with a weight of 18.49 pounds and earning $1,200.00, while the Treznevant, Tennessee team of Mark and Billy Arnold placed fifth with 18.17 pounds, earning $1,000. In all the top 16 of the Semi-Pro teams received either a check or prize. Amateur Division winners Dave Carpenter and Ron Ivey. Dave Carpenter of Paris, Tennessee and Ron Ivey of Springville, Tennessee took first plac in the Amateur Division with a two-day total of 21.89 pounds. Carpenter and Ivey fished manmade cover on the west side of the Big Sandy River using one pole vertically jigging in 8-13 feet of water on Mustad Wide Gap Hooks and Southern Pro Motor Oil and Red/Chartreuse tube jigs to catch over 120 keepers over the tournament. The team earned a new Ranger 117VS rig valued at $31,500 for finishing first. Second place and $3,000 went to the Mayfield, Kentucky team of John and Matt Feagin with 19.51 pounds. The Feagins vertical jigged a main point in the Blood River area using Southern Pro orange/chartreuse and blue/chartreuse jigs in 11-18 feet of water, catching over 100 fish. Johnny Clary of Greenbrair, Tennessee and Dwayne Craig of Cottontown, Tennessee placed third with with 18.77 pounds, earning $1,500. Johnny and Dwayne were fishing from bridge to bridge on secondary river channels in 17 feet of water vertical jigging with one pole each using Crappie Magnet jigs to catch over 100 fish in the tournament. The Mt. Juliet, Tennessee team of Harold Maddux and Brian Oldham placed fourth with a weight of 18.75 pounds, earning $1,000. Keith Griffin of Trenton, Tennessee and Brent Smith of Rutherford earned $800 for finishing fifth thanks to a weight of 18.28 pounds. Taking big fish of the event was the team of Bill and Roger Gant of Corinth, Mississippi with a 2.51-pound crappie, earning the team $1,050 in cash. They caught the big fish right in front of the Lake Barkley State Resort Park Lodge using a Gant hair jig tied onto a Mustad gold hook and tipped with a lime and black Southern Pro hot grub in 26 feet of water.